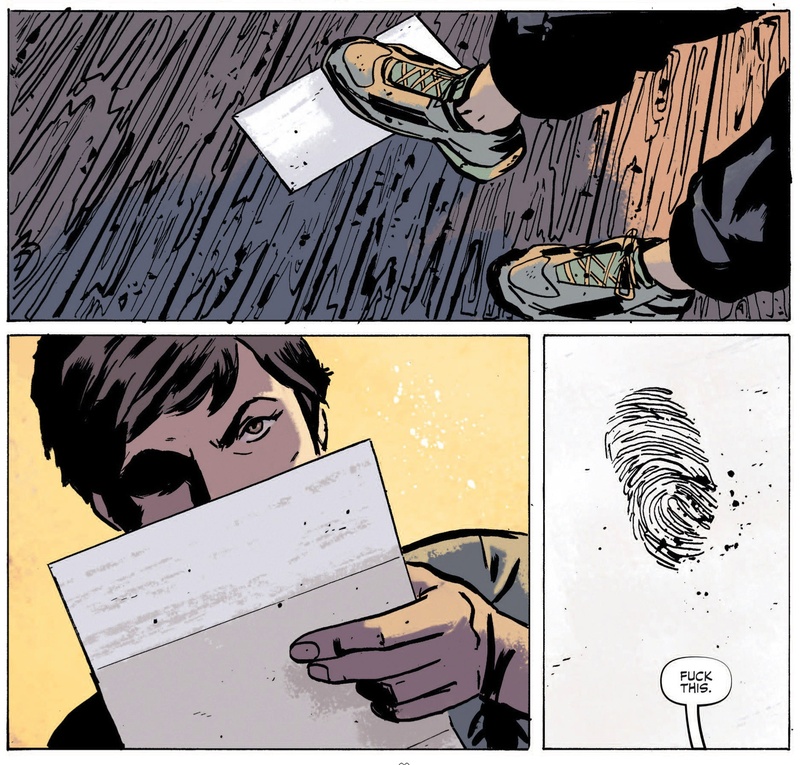 Thumbprint #1 – Who watches the watchers when it’s dark? Joe Hill is a writer of rich pedigree, and has published three well-received novels, numerous novellas and the comic, Locke and Key. I often find that an author who takes to writing comics has a different approach to the graphic art form. Locke and Key is an example of this as an exceptional and well-constructed idea with excellent artistic execution. Thumbprint was released as a short story in 2007 and has now been adapted into a comic series. Joe collaborates with Jason Ciaramella who has adapted the previous Hill short story, The Cape. His work predominantly features at IDW and he has been previously nominated for an Eisner award. Vic Malhotra completes the trio in providing the art to the story. Vic is a Canadian artist whose previous works include Tiger Lawyer, an appearance on Murder Book and the webcomic Fort Ripley and the Gangsters of Kalamazoo. 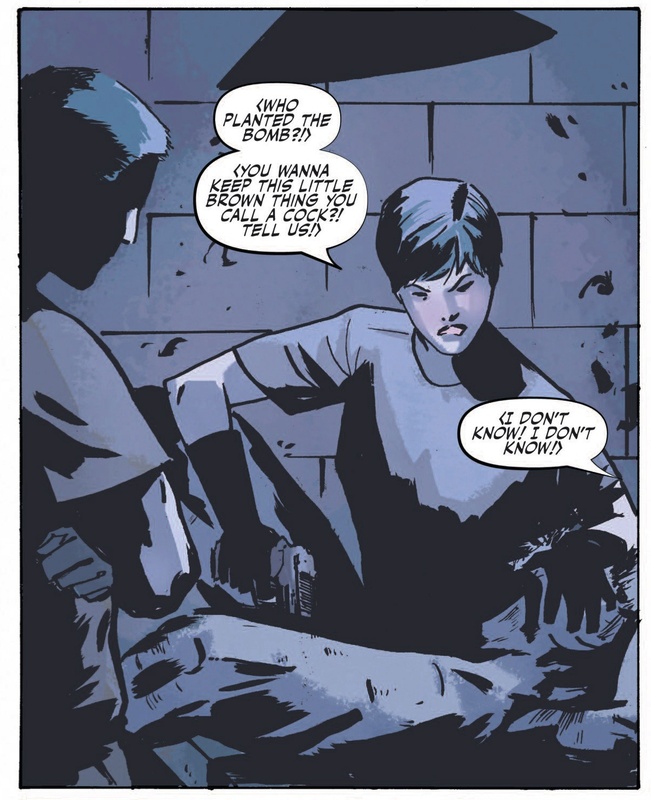 Thumbprint focuses on a female US soldier, private first Mallory Grennan who returns from a posting at Abu Ghraib. If you can recall the photographs leaked from that particular Iraqi base, then the tone of the book is instantly set. Thumbprint is an uncomfortable book about how Mallory’s past indiscretions come back to haunt her, in the form of an ominous thumbprint. Grennan’s exposition is played out with her current monotonous lifestyle amongst memories of her war hero father and torrid times in Iraq. The writers deliver an introspective confessional monologue, which allows the room for Vic to draw incredibly unpleasant memories of her inflicting verbal abuse and physical torture of suspected terrorists. The writing portrays her regret and guilt well, but it is not overly articulated because Malhotra’s use of facial shading and muted emotional disposition provides the expressive depth. This is very well demonstrated by Mallory’s reactions to her work colleague’s immoral actions. The book is far from scared to show despicable abuse and torture tactics, especially the panels of waterboarding, which are genuinely difficult to look at. The colouring is beautiful and is used very effectively in showing the drab and dark times of Mallory’s past. Contrast to this are the lovely bright and yellow woodland where she goes running in the current day. Add in the mystery of a thumbprint on a plain letter, hand delivered to her house referencing her past, and we have an unknown antagonist stalking their prey. The key to the book lies with juxtaposing the fear and terror of an unknown assailant with the injustice and innocence of the victim. The scenes from Iraq convey this incredibly well with panels showing detainees naked or wearing women’s underwear. Watching Mallory partake in this abuse is incredibly hard as she is our protagonist, even when we bear witness to her guilt and regret. This is where the irony comes into play, as her defiant terror at being stalked represents her becoming the victim of the torture she once inflicted. Our emotions are toiled with, as the story’s complex themes intertwine, and there is no clear guilty party to feel for. It is an uneasy read because of the tough subject matter and is conveyed with excellent literary and artistic exposition. 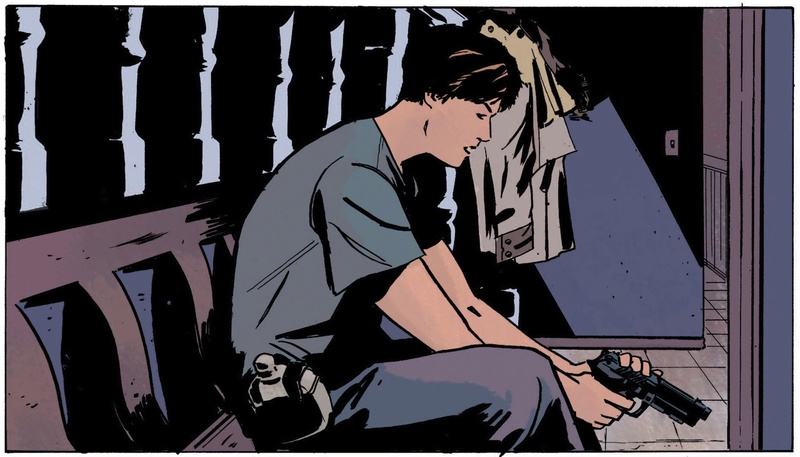 This issue is a well balanced opening issue and an example of how to depict terror and elicit empathy. I genuinely feel for Mallory’s situation but seeing her pose happily in front of a camera, with her foot forced down on the head of an innocent man, makes me sick to my stomach. Next PostThe Theatre List 19/6 – A whole three DC books!